Over the last couple of editions of Football Manager there’s been talk across the FM Twittersphere of the game becoming more like Morale Manager. In my opinion, SI have got this pretty spot on. FM reflects the IRL football world with players not getting on with you or each other, complaining about training or about not playing enough, requesting a transfer and more. I’m going to take you through some of my ways of managing morale across my players in this piece. These are ways I’ve found work for me, they might work for you too or you might have completely different ways of approaching it and still get results and win trophies galore. That is the beauty of this game we all know and love. The first thing is to think about how you set up your manager profile and the attributes you give yourself. If you’ve set yourself as an former non-league footballer and you decide to take over a top six English club, you’ve got an uphill struggle on your hands to win the respect of those players. Starting at a club with lower expectations or lower down the leagues, and setting your reputation to be the standard for that level gives you a good chance at fostering a good relationship early on. If you want to take a bit of an easier road, stick your reputation up a notch for the level you choose to start your save in. You can see I’ve made some serious gainz across the board in my save so far, but that when I started out in my first season, my motivating attribute was at 18, my highest attribute. This was in the hope that I’d be able to get the players behind me and invest in me as a manager before, during and after matches, building a positive relationship and team spirit. I’m a big believer in players having positive relationships with their manager and their teammates will lead to positive performances on the pitch. Out of my 28 man first team squad (I like rotating), 23 of them have me in their favoured personnel. These lads will run through brick walls for me. Significantly fewer of them have one of their current teammates in their favoured personnel, but that doesn’t mean they don’t like them. 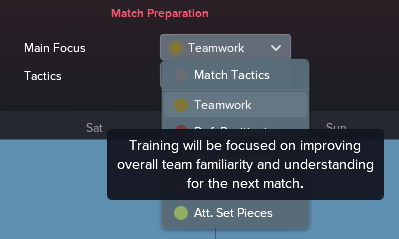 I pointed it out before in my 4-4-2 tactical piece but I’m a fan of the new “relationships” feature on your tactic. Having the players connected on the pitch fosters a cohesive team, one that knows each other inside out. 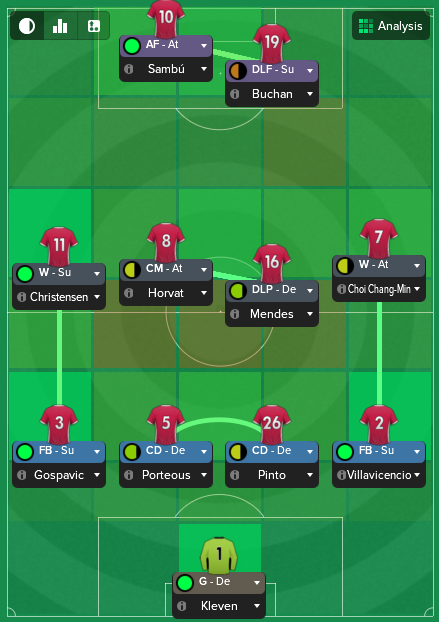 Every player has their price in my team, but I like to keep a good chunk of my players together from season to season, especially the spine of my team. Keeper, Birk Kleven, is entering into his fourth season at the club now, with 55 clean sheets to show for it across 107 matches so far. Captain, leader, legend, Ryan Porteous, has now played under me for 308 matches and is in his ninth season at the club. Edvin Horvat appears in most summary posts as one of the standout stars each season and this is his sixth season at the club now. These players know the club inside out and ensure the rest of the squad is moving in the same direction. There’s been a fair bit of change around this spine over the last few seasons, none more so than upfront. Where we had the dynamic duo of #Rog and Ryan Hardie together up top for five seasons, the front line has been much less settled since they fell out of favour and ultimately left the club. You saw the Pharaoh and Radovanovic leaving last season, Keaton Lockett has followed them out of the club this summer. If Sambu has a similar full season to the form he showed in his initial half season of first choice striker, he won’t be with us for very long either. This makes it much more difficult to get a positive relationship between my front two, #Rog and Hardie had each other in their favoured personnel, they knew each other inside out. My approach to personalities on the game is taken from the All Blacks, after having read Legacy by James Kerr, “no dickheads”. In FM terms, this means no negative personalities. Stirling players are determined to succeed (we have the highest average determination attribute in the league and our collective squad personality is determined) and just like the All Blacks they need to put the team before themselves. Having players with similar personalities only enhances the potential of them all getting along and reduces the risk of fallouts. If you can’t change the player, change the player. Every player has a price, remember. This FM18 addition should be something I look at much more than I do when it comes to this kind of topic. A quick glance at it for the purpose of writing this piece shows me that Porteous, Kleven and Horvat are my team leaders, that makes sense given that they form the spine of the team, and that our dressing room atmosphere is excellent. Apparently it can be said that we’ve got too many team leaders though, I don’t see this as a negative. All players at the club should custodians of the Stirling culture. Right now, having morale as a column on my squad view makes me feel like I don’t need to visit the dynamics tab. I wonder if or how SI will switch it up for future games and surface it a bit more than those summary emails we occasionally get, maybe it doesn’t need to be? This is certainly an area where I know I play the game differently to others. I do every single teamtalk and every single press conference because I believe they can have a really positive effect on creating a positive relationship with the players. My approach is just to be honest with the players. If I think we can win, I tell them that. If I think that we’re maybe going to struggle up against a better team in Europe, I don’t put any pressure on them to come out with a result, I won’t be annoyed if we don’t win. A bit of the hairdryer treatment isn’t off limits, but that’s mainly used at half time to stick a few rockets up their arses if I don’t see them performing well enough. The objective, as I’m sure it is for most others, is greens across the board. Getting the players delighted and/or motivated. The players are listening, so when the opportunity arises in a press conference to praise the team or an individual player, and of course it makes sense to do so, I do it. This will only strengthen the relationship they have with me. This isn’t something I dish out on a regular basis, but it’s another tool that can be used to reinforce positive relationships with players. Chang-Min scored a double from right wing in our last match against Ross County. He’s a new addition to the club having joined in the summer, and is also an 18-year-old Korean, so is just a young lad in a completely new country and culture. A little bit of praise for his last performance is just like throwing a metaphorical arm over him and letting him know he’s doing well. It could really go a long way to him keeping that form up. He’s also just picked up both the player and young player of the month awards for October, congratulating him on those wins will only further help. I would say that contracts and transfers come into managing player morale too. When you’re signing a new player, it’s important to not just promise them that they’ll be an integral member of your squad if you know they’ll struggle to break in to your current first team. It might be an obvious one to some, but it’ll save that player coming to you a few months down the line to moan about a lack of first team football, which in turn might also save some of his teammates coming out in support of him and that positive atmosphere in the dressing room going down. Like I said already, everyone has a price. If a player comes to me asking to leave I’m very unlikely to stand in their way, as long as we get fairly compensated. There’s no use keeping an unhappy player around the squad, potentially risking the happiness of the rest of my squad. It’s often possible to try and win the unhappy player round, continue playing him in matches to see if he’ll change his mind, but this isn’t something I’d recommend to do all the time. Think realistically about it, taking the club you are into account. If your reputation isn’t quite up there with the best yet, then it’s probably worthwhile cashing in and allowing the player angling for a move to a bigger club to leave. I’ve called this out a few times before but one of the first things I do on the new game is pull minutes played into my default squad screen views. This helps me monitor how much game time my players are getting, and feeds in to how much I rotate (which is often with my 28 man first team squad!). It also feeds in to ensuring that certain players don’t become unhappy. If players with a back up or rotational status aren’t seeing those promises be met, or key players or first teamers aren’t playing regularly, then it might be time to either start them or stick them on the bench for some potential first team minutes. It also helps if your team is playing well when a player raises a concern about their lack of playing time. The option to tell them that player X in their position is playing well and it’d be a struggle to drop him right now usually works quite well in seeing them drop their issue. Not a big one to finish off, but I have my match preparation training set to teamwork permanently and do this for a day and a half before a matchday. These are known to give a little boost to whatever you pick pre-match, whether it’s attacking movement or defending set pieces. Teamwork focuses on improving team familiarity and understanding. For me, this just adds to the players feeling as one and knowing where to be and how to work together on the pitch. Ultimately, this leads to us winning matches which leads to happy players. Simple. Obviously there are a lot of factors that go into keeping your players happy. I said at the beginning that there’s FMers out there that won’t do any of these things and they’re still able to find success. I feel like the things I’ve outlined work well for me, that’s not to say that they actually do all factor in to how morale works in the back end of the game. If you feel like you’ve picked up something you’re going to take into your own save from reading this let me know! Plus, if you do any of these things differently, or have completely different techniques altogether then let me know too! I’d be happy to hear about them. If you’ve liked this post you might also fancy having a read of how I monitor and manage my players fitness over the course of the season. Spoiler alert, it wasn’t through the medical centre. That was a brilliant post Chris and something I haven’t really thought about. I do tend to get a lot of my players complain about lack of first team football and that they want to move to a bigger club. I am going to apply some of your tips to my save and I’m sure it will improve things. Off to read your player fitness and tactic post mentioned. Thanks for reading, Matthew! Awesome to hear you might take a few of these things into your own save. Let me know how it goes, fingers crossed you see a little bit of an impact at the very least.